If you want to see the complete edition of our 2013 Tour de Lead Graffiti project of 23 posters printed via letterpress on our website, click here. From there, click on the poster image to advance to the next day’s poster. Each stage has a thorough story about the day and how they helped impact the poster along with photos of the studio and lockups. From any of those pages you can also view the 2011 and 2012 editions. Now, a gran fondo starts this story in motion, so let’s define that first. It is the Italian term used in the U.S. and some other English-speaking countries for an organized, short-to-long distance, mass-participation, cycling event, typically held annually. Alexander Wolff, a senior writer for Sports Illustrated, is working on starting a gran fondo in Middlebury, Vermont, this coming summer. One element of the event is an exhibition related to cycling. His sister, a book artist, said he should look at Lead Graffiti. She had seen our Tour de Lead Graffitiproject on the Book Arts listserv. About 4 days later we get an email from Sports Illustrated (we are talking about the magazine with a 3,150,000 subscriber base). 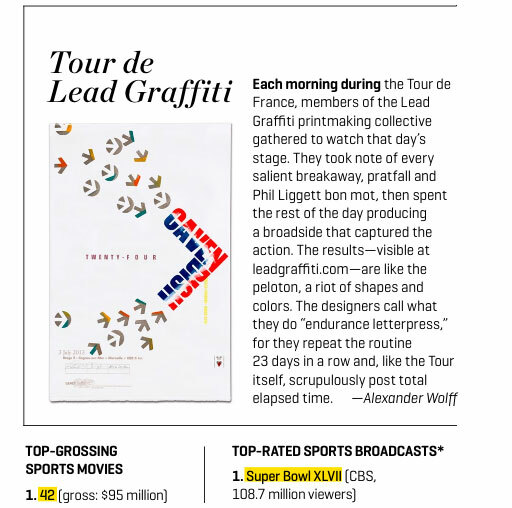 They want to do a small article in their print and iPad editions on Tour de Lead Graffiti for their “Year in Media” issue and ask if we can send some images. Oh, baby! It was so exciting to have a personal project produced in a centuries old process get noticed by a major national magazine. We fire off a half dozen high-resolution images of our favorite broadsides from 2013 and then start checking out all of the local newsstands. The suspense was killing us. Which image(s) would they use? How large? Who will write it? What would they say? Would people understand it? Where would it be in the issue? Honestly, would it even happen? We were holding off announcing the article until we’d seen it firsthand. We broke down and posted an announcement on Lead Graffiti’s Facebook page. Later in the day we get a call from Mark Deshon, a designer and former student of Ray’s, who lives just down the street from us and was a collaborator on Stage 5. He had gotten his daily mail, including his subscription to SI. He opened the mail, dealt with bills, and sat back to peruse SI. He says he has a ritual way of looking through the magazine—always front to back, sitting calmly and comfortably with minimum distractions. Just for the record, he hadn’t yet seen our Facebook post. Page 25. Out of absolutely nowhere, there is the Stage 5 broadside. We cannot even imagine the neuron burst that would be happening in Mark’s brain, seeing the oh-so familiar image and it being so far out of its normal, everyday context. Above is the December 16 article from Sports Illustrated highlighting Stage 5, written by none other than Alexander Wolff himself. The broadside, focused on a the 24th Tour stage win by Mark Cavendish (a Lead Graffiti favorite) was designed and printed by guest collaborator Mark Deshon, working with Ray Nichols, Jill Cypher, and Tray Nichols, at Lead Graffiti.